WASHINGTON, D.C. – On July 5, fifteen student and teacher pairs returned from Normandy, France where they concluded a year-long program by reading emotional eulogies at the graves of American service members who lost their lives in World War II. 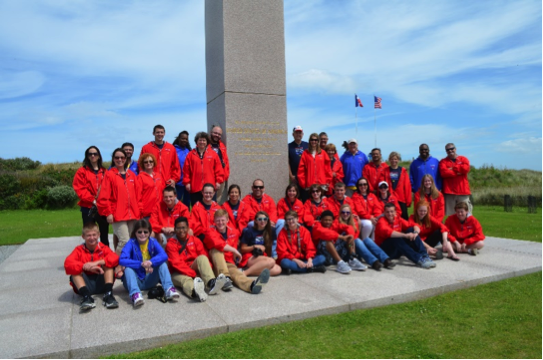 The Normandy Sacrifice for Freedom: Albert H. Small Student and Teacher Institute seeks to teach a new generation about the sacrifices and challenges faced during World War II. Each teacher and student pair chose a service member from their home state who made the ultimate sacrifice for freedom in World War II. The fifteen Silent Heroes were honored with eulogies read by the students at their graves in the American cemetery in Normandy, France. The program is coordinated by National History Day and is funded by a generous donation from Mr. Albert H. Small, a veteran himself. In its fifth year, the program brings students and teachers from around the world to Washington, D.C. for visits to the National Archives, Arlington National Cemetery, and lectures from World War II veterans and historians. The final stage was a journey to Normandy, France where participants traced the route of their Silent Hero, walked on the beaches of Normandy, and, using their extensive research, read a powerful eulogy at the grave of their Silent Hero. Throughout the program, teachers and students create a website about their Silent Hero. In the coming weeks they will use these websites in presentations to local community groups, to their schools and classes, and to veterans organizations. This year the student and teacher teams come from the following areas. To interview any participants or coordinators, please contact Gary Pettit at 301.405.0536 or gary@nhd.org.